1. Start Internet Explorer and make sure that you are connected to the Internet and can browse. 2. 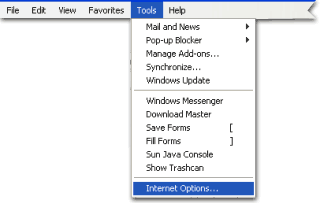 Select "Tools" and "Internet Options..." from IE's top menu, as shown on the figure. The "Internet Options" form will pop up, as shown below. Click on the "Connections" tab. 3. 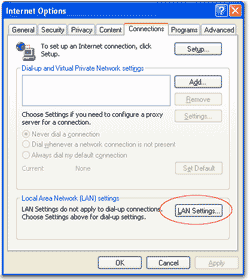 If your Internet connection is via a local area network, DSL, ADSL, ISDN, or Cable modem, then click on "LAN Settings..." in the "LAN settings" section, as shown below. 4. 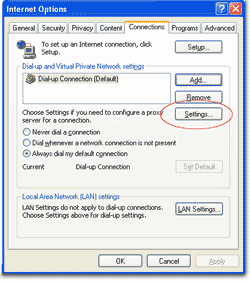 Otherwise, if your Internet connection is a dial-up connection, make sure that your Internet service provider is selected under "Dial-up settings" and click on "Settings" in the "Dial-up settings" section. 5. 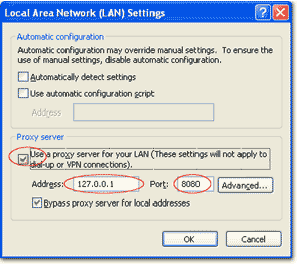 Make sure that "Use a proxy server" is already checked on the Settings form. 6. Click "OK" to complete the Settings form. The toonel.net application must be running all time when you are accessing the Internet. If you decide do not use toonel.net please uncheck “Use a proxy server" on the Settings form.